Store Jet rack step ladder storage system in unused space on the ceiling or wall of your vehicle or storage room with this easy-to-use tension securing storage system. The JET Rack® stores A-frame step ladders up to 10 feet in length that have “ tool holes” in the top plastic shelf or cap. The Jet Rack® step ladder storage system can store in the unused space on the ceiling or wall of your vehicle or storage room with this easy-to-use tension securing storage system. The JET Rack® stores A-frame step ladders up to 10 feet in length that have “tool holes” in their top plastic shelf or cap. Simply hook the ladder’s top shelf hole onto the Jet Rack’s receiving pin, slide the ladder forward into place, and secure the foot of the ladder to the JET Rack’s catch bracket. For mounting, a 7/8" deep Unistrut type hanger rail, not included, is mounted to the flat surface where you want to mount your JET Rack®. The JET Rack step ladder storage system mechanism is then mounted to the Unistrut™ to complete the installation, usually in about 30 minutes. 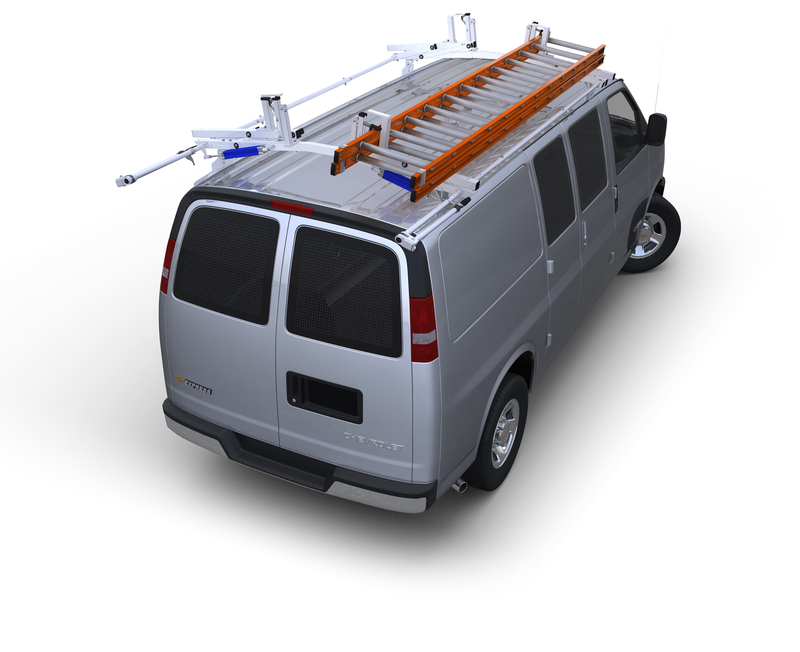 For a rock-solid mount in truck caps or vans with protruding roof support beams see our Universal Mount System with high strength fasteners and conforming mounting plates sold above. Unistrut™ rails can be found at supply houses and home stores nationally and need to be approximately the same length of your ladder. Not compatible with our Floor Saving Shelving.